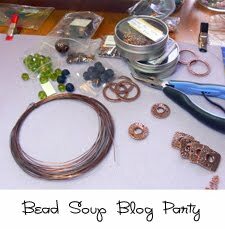 Many of you have heard of the Bead Soup Blog Party. It's a bead swap challenge that occurs at least three times a year (the next party date will be announced next week -- save a date in January!!!!) and it's a huge blast of fun and creativity. 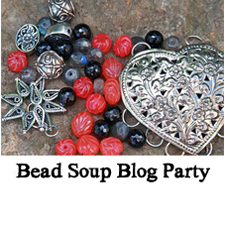 We didn't want the fun to end, so there is also a Bead Soup Blog Party Yahoo Group, open to those who would like to participate in smaller challenges, general bead swaps, and things of that nature. If you'd like to join the group, click here! Our most recent challenge was to choose a piece of jewelry we had in our stash that hadn't sold for whatever reason, swap it with someone, and make a new piece of jewelry out of the piece our partner sent to us. The list was an odd number, so I had the pleasure of working with two partners! First up, Johanna Rhodes of Fire Phoenix Creations. 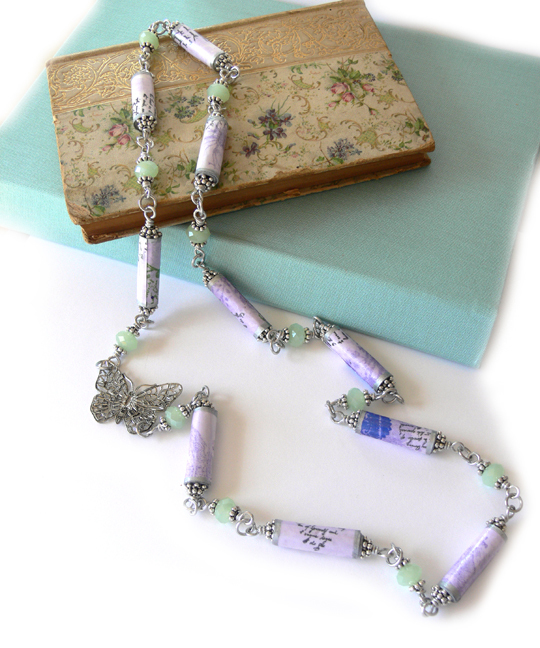 She sent me an adorable bracelet created with handmade paper beads wrapped in colorful wire, all adorned with a butterfly and a purse charm. The beads dangle from a gunmetal chain. The bracelet, as Johanna sent it to me. I wanted to make sure the cool handmade paper beads were showcased, so I decided not to go too wild. I chose a coordinating color to go with them -- in this case, a pretty light green. Each bead's edge is painted in silver, so I coordinated that with heavy-gauge aluminum wire to link everything together. I didn't use the purse charm, but did use the butterfly as a side focal. The result is a long necklace that didn't need a clasp at all, as it can easily be pulled over the head without messing up your hair. So there you go! From bracelet to necklace. I hope I showcased her beads well! The next piece came from Sharon Misuraco of Off the Beadin' Path. 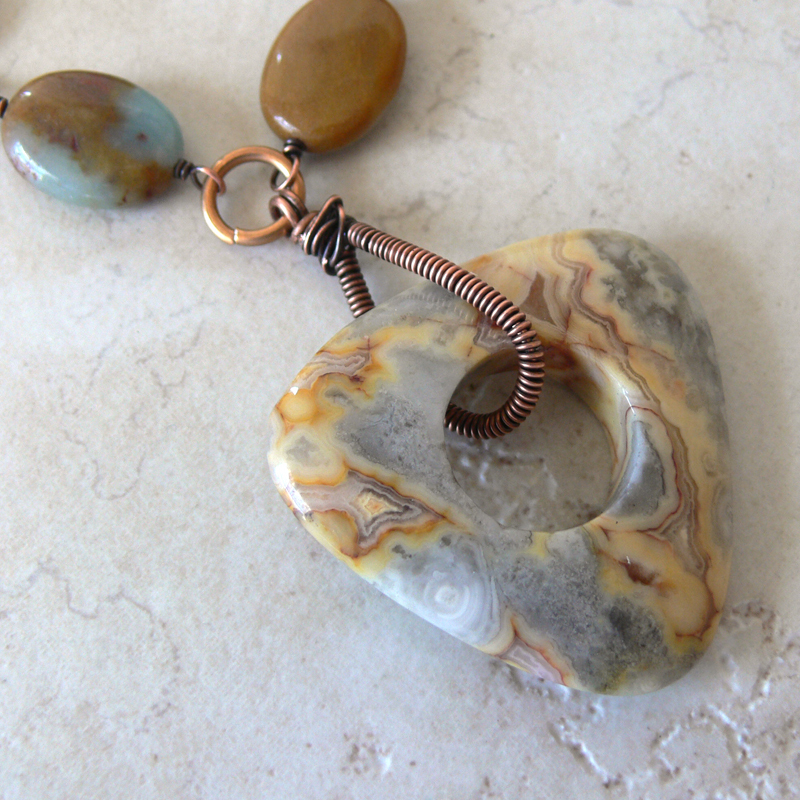 Sharon sent me a gemstone necklace made with small aquamarine coins, brown amazonite, and what appears to be a crazy lace agate triangular donut. I did a little research on the internet on brown amazonite, and it's also called rainbow amazonite. I've never worked with this stone before, so was happy to give it a whirl. Necklace as Sharon sent it to me. Sharon did a pretty job with the wire wrap on the donut in silver, but I'm running low on silver, and with the cost of sterling through the ROOF these days, I'm trying to get a little creative with what I'm doing lately. So I pulled out some oxidized copper, hammered some copper washers (oh, how cathartic hammering is! ), found some orphan lampwork beads, and awaaaay I went! When faced with the wrong gauge for the donut bail, I wrapped the wire with more wire. 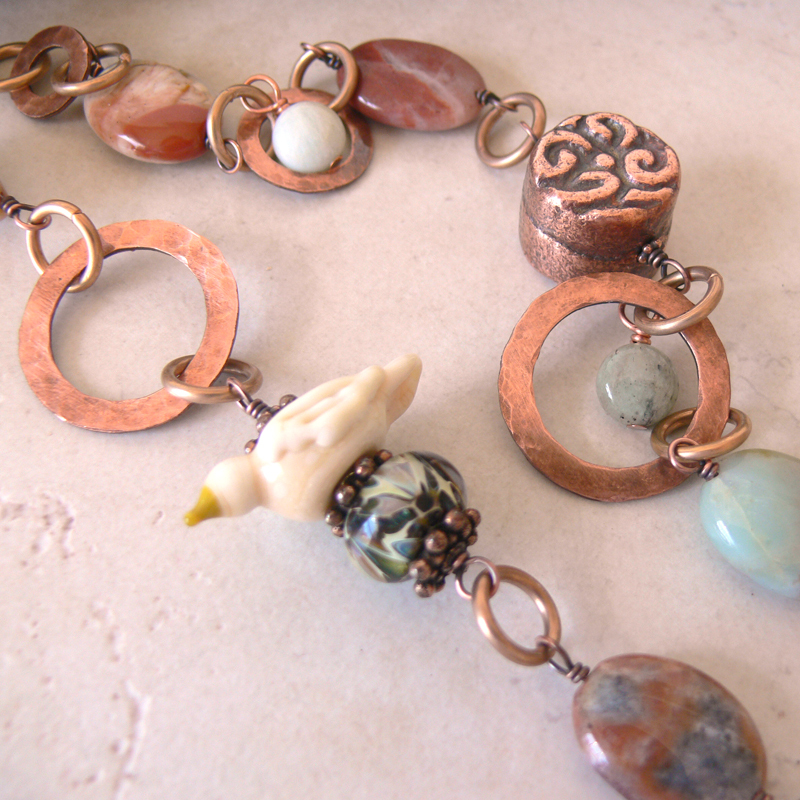 I didn't use a lot of the aquamarine, but did dangle some between the hammered copper washer "frames". I also used a lampwork bird by Lori Lochner, paired with a lampwork orphan bead that had been languishing by its lonesome in my bead drawer, and a copper-coated aluminum bead I recently purchased from the Potomac Bead Company. I call this one "Painted Canyon". 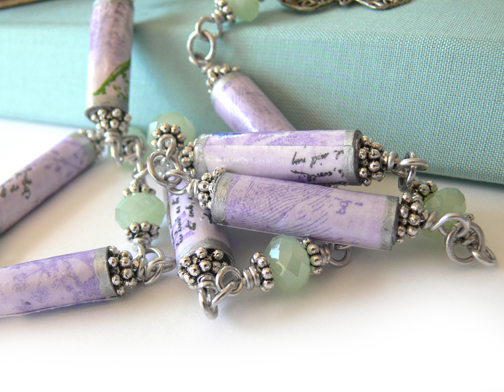 I hope you'll visit the rest of the Bead Soup Jewelry Exchange participants -- their names and blogs are below! Just click their name to travel to their blog. And don't forget to save the date for the next MAIN EVENT -- click here for the details! Lori Anderson creates jewelry for her web site, Lori Anderson Designs, and writes the blog An Artist's Year Off. She's also a contributor to Art Bead Scene. What gorgeous transformations of already gorgeous pieces. Love the darker copper look and the double wrapped copper bail. I have been around to quite a few sites already. This is a super interesting blog hop. Thanks Lori. I love what you did with both! Love the bail for the donut. both these reworks are gorgeous. 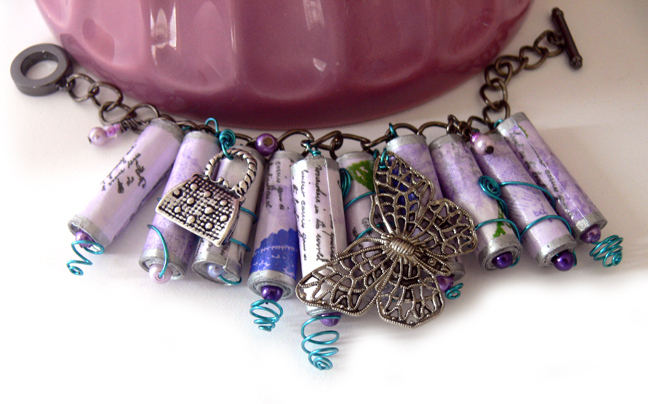 the paper tubes really stand out in a necklace. the choice of copper in the second piece was perfect. i love this one. I love it! I really like that you put the green and purple together, that's a really super colour combination and I wouldn't have thought about it myself. I'm also really impressed with the second piece, the copper components really add some oomph to it. Awesome, Lori! 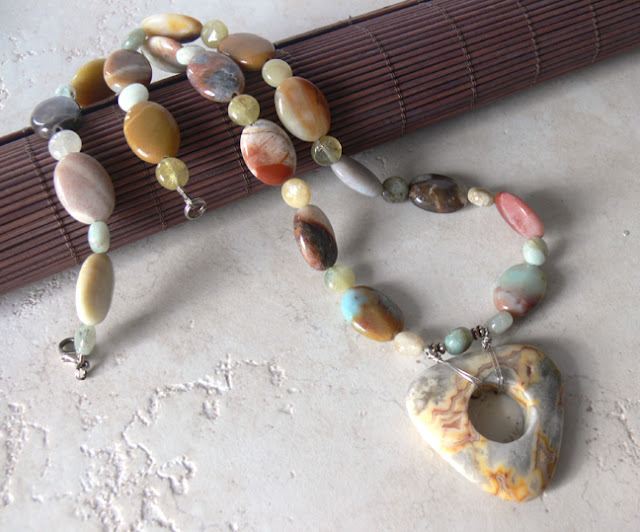 I was so curious to see what you would do with the ho-hum amazonite necklace! So sorry I forgot to include a nice clasp, but you did wonders to make it come alive! Copper is the best! What a clever and creative way to make the bail stronger with more wire, looks like you planned it! Love the choice of green with the paper beads, such a calming pairing. We insomniacs need "calm", but beads are exhilarating! Both pieces are top-notch professional and fun at the same time! Thanks again for doing this Bead Soup and for being my partner! Gorgeous, Lori! I love what you did with both necklaces! Wonderful, Lori! I love the addition of the metal to the stones - really makes it very contemporary - and beautiful! And the paper tubes necklace really shows the tubes off as they deserve! What a lovely transformation of both pieces. I especially love all the texture you added with the wire and metal beads to the second piece. Great job Lori, I especially love what you did with Sharon's beads--well done! Leave it up to you Lori, to come up with these great ideas. I love what you did with both of the pieces. I'm hoping to get in for the next Bead Soup. Great job, Lori. I love the interesting bail, and the darker colors on the one necklace. Lori, I love what you did with your pieces. This was so much fun! Thank you for your hard work! I'm so bummed i missed out on this challenge! looks like fun! I like the paper beads idea. They are lovely. GOR_GE_OUS!!!! Love the transformations - they do look like,totally different pieces. I like the choice of silver waaaay better with the tube beads and copper brings out all the colors in the second necklace. Oh Lori, I so wanted to do this challenge but was overcome by life's events and couldn't swing it. But I *love* what you did with your 'fixins, and I can't wait to visit the other blogs for theirs. 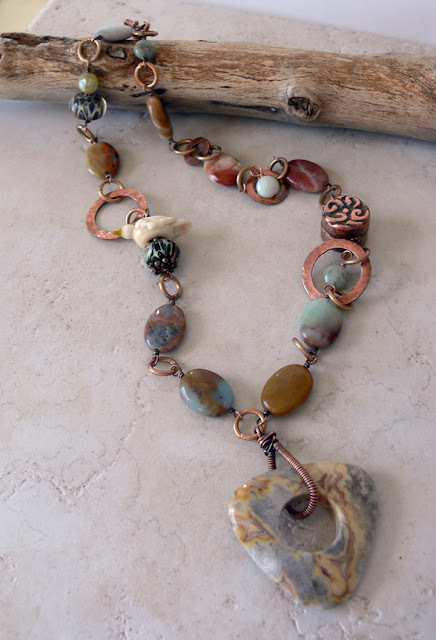 There is something really cool about re-purposing jewelry and making something even more fabulous from it. It's like those shows on TV where one room can get a whole new look when a designer takes stuff from the home owner's own house and gives it new life. I'll be blogging about the challenge too! Beautiful pieces to start with - I love those handmade paper beads - and matched up with that pale green - so lovely - a perfect spring necklace! And that copper bail you made - so cool - love the colors of the painted canyon. Thanks so much Lori for hosting such an awesome swap!!!! Can't wait to sign up for the bead party. Thanks to my friend Cathryn for hooking me up with your blog and beautiful beadwork. Wonderful transformations - just beautiful. This was a great idea for a challenge! Both pieces look wonderful Lori. The wrapped copper bail looks fabulous. Wow what great pieces! You did a great job, love them both. Wow, stunning! Isn't it amazing how someone else can see something new in a piece and remake it? This sounds like a fun swap to do with a friend. Wow I super love your works! Gorgeously beautiful, they all look so nice and the color combination is cool! I wish I could make some of my personal touch as well, thanks for your shared information.